While I’ve always referred to this drink as “bubble tea,” it’s also known as boba tea, pearl milk tea, boba juice, and bubble milk tea. It was invented in Taiwan in the 80s (hands-down THE best generation of music)… and while bubble tea recipes now contain a variety of ingredients including tea, fruit, milk, syrup, and juice to which tapioca pearls (the bubbles) are added; the oldest known bubble tea was made with hot Taiwanese black tea, condensed milk, syrup, and small tapioca pearls! 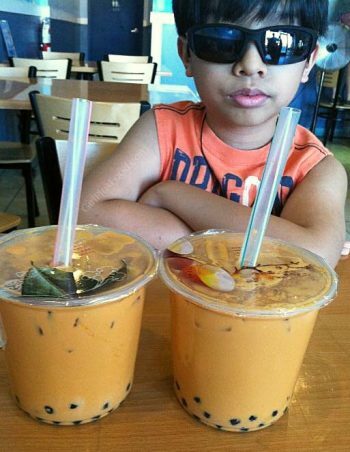 I had my first bubble tea experience while visiting Seattle during my pregnancy with JRoc. My brother’s girlfriend at the time was making a HUMONGOUS deal about having me try this mysteriously fun-sounding drink! The unique beverage contained HUGE tapioca balls (boba/bubble), and served in a plastic cup and sealed with plastic wrap decorated with cute pictures. And you sip the tea and boba with these super-wide straws! Topping off the yum with extra kawaii… you can’t tell me that’s not fun! And btw, that’s JRoc back when he was NINE… isn’t he just the coolest little badboy evarrr? Oh, and before I forget, those were Thai Milk bubble teas! MY FAVORITE! Ok, so the point of this post is that you can EASILY make these yummy treats at home! 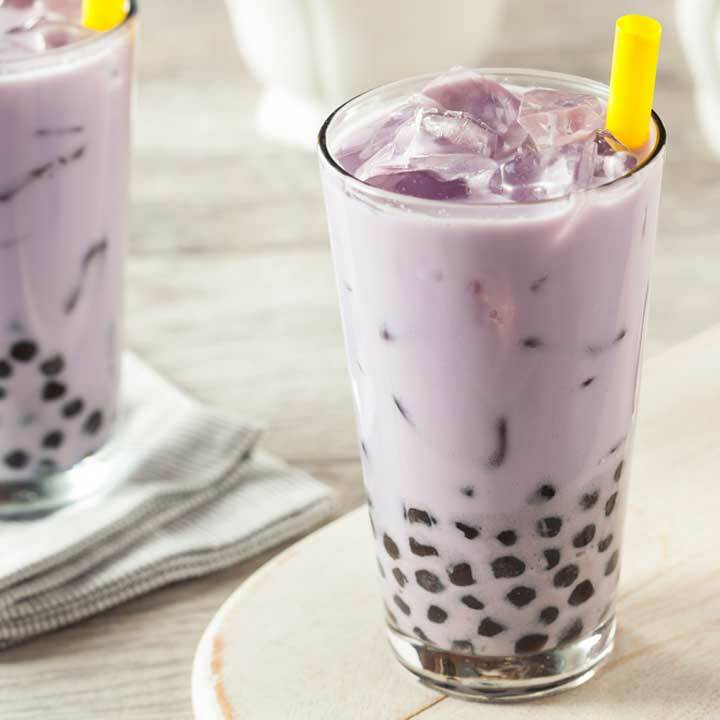 I’ll show you THREE ways to make your bubble tea: 1) Plain, 2) Milk, and 3) Flavored (your choice!) bubble teas! FIRST, you need BUBBLES! Because without them, it’s just TEA. 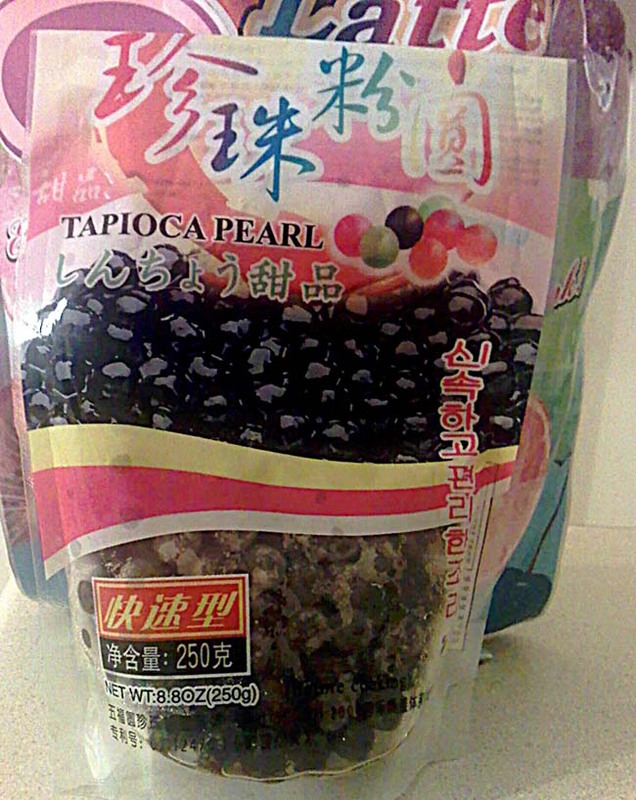 You can find bags of dried tapioca pearls at your local Asian market… or order from Amazon! Boil 10 cups water for every 1 cup tapioca pearls. Add pearls into boiling water and gently stir to keep pearls from sticking to each other. When pearls float to surface, cover pot and cook on medium heat for 10 mins. Scoop out pearls, drain the large pot and replace with cold water. Return pearls to pot of cold water and let them sit for 1 minute. Prepare 2 cups black tea or flavored iced tea of your choice. Pour into chilled glass, add tapioca, ice cubes, and serve with a wide straw! Prepare 1 cup black tea or flavored iced tea of your choice. Pour tea into chilled glass, add milk of your choice, tapioca, stir in ice cubes, and serve with a wide straw! Blend milk, your choice of flavor (fruit, coffee, tea, etc) and ice in a blender. Pour into chilled glass, add tapioca, stir in ice cubes, and serve with a wide straw! Blend water, bubble tea powder, Coffee-Mate, and ice in a blender. Pour into chilled glass, add tapioca, and serve with a wide straw! Wow, Boba tea FIVE ways! I’m an addict and you are my new hero! THANK YOU!!!!! !